There’s no doubt that a small closet storage space isn’t exactly ideal. Small closets typically are more difficult to keep organized, especially if they’re not designed very well and lack important features. And messy closets always result in aggravation, stress, and time wasted looking for things. A OnePoll survey found that 3 in 10 women believe an organized closet would make their mornings less stressful. The same survey also found that 47% of women struggle when it comes to picking a work outfit from their closet. While indecision plays a role in how much time is wasted, closet disorganization undoubtedly plays a much larger role in your day getting off to a less-than-productive start. That’s not to say larger closet spaces are easy to keep organized, mind you. You just have more leeway when it comes to making mistakes with the storage optimization of the space. How do you maximize your small closet storage space? 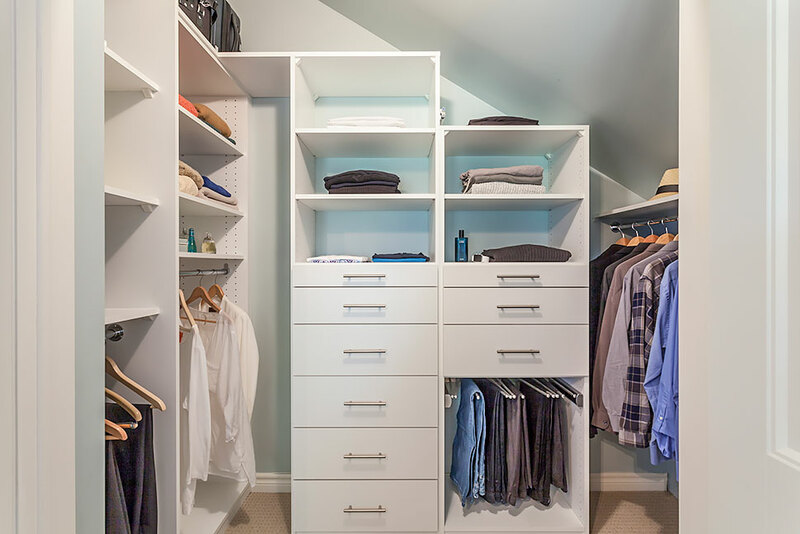 Small closets can obviously be found everywhere, particularly in older homes and small condos. So what’s the secret to making the most of such a small space? The solution to your small closet storage woes lies with smarter storage and organizations solutions that facilitate better space management. Being more choosy about what’s kept in your closet also helps. A small closet storage space is, in fact, capable of being well-organized and very functional. And we’ll show you how to accomplish this with these nine smart strategies for getting more out of your small closet storage space. When you have a small closet storage space, it’s imperative to be more finicky and selective about what’s kept in your closet. You simply don’t have enough space in there to store clothing that’s barely worn. Or never worn. One study found that American women have an average of $550 worth of unworn clothing in their closets. Pare down your closet wardrobe so that everyday and weekly clothing favourites are prioritized. Clothing gets lost and buried in disorganized closets. If an item of clothing is easily visible in your closet, you’ll be far more likely to actually wear it. And if you’re wearing it regularly (or at least semi-regularly), it’s worth the valuable small closet storage space it’s occupying. The Classic closet organizer can make your small closet storage space easier to keep organized. You’ll find it easier to keep a small closet space tidy (or any closet space, for that matter) by adding a closet organizer to it. Custom closet organizers are a better choice than the one-size-fits-all types you’ll find at a big box store. They can be custom-designed to perfect fit within your small closet storage space. Every inch of precious space within your small closet will be considered when your custom closet organizer is designed. That maximizes its functionality. A custom closet organizer’s variety of design options also gives you more freedom to complement your home’s décor. Our SmartLine and Classic organizers can transform your closet space. Store seasonal clothing somewhere else besides your small closet storage space. When closet space is at a premium, keeping clothing that’s only worn for half the year (or less) just doesn’t make sense. Turn to other bedroom storage solutions for keeping your out-of-season-clothing stored. Another option is to store some of it in suitcases to save you space. The storage space in your closet’s upper reaches may not be efficiently utilized because they’re difficult to access. If that’s the case, use a good step stool (like the SlimStep ladder, available in our showroom). They make it easier to access hard-to-reach upper closet areas and also come in quite handy in other areas of the home. When you’re dealing with small closets, it’s crucial that the storage space be maximized. If you have deep closet shelves with empty space at the back, add small baskets to hold knick knacks or less frequently used smaller articles of clothing. They’ll stay organized in the baskets, which can easily be pulled forward when needed. When one of our design consultants is evaluating your closet space, they can suggest ways to better utilize underused areas within it. 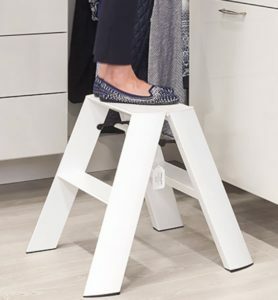 Use a step stool to access hard-to-reach areas in your small closet space. Add extra hanging rods in your small closet storage space, if space allows. This makes better use of your limited closet space and prevents the clothing hung on your single hanging rod from being crammed too closely together, which causes wrinkles. A lower hanging rod for short hanging garments like pants, shirts, and skirts ensures that valuable closet hanging space isn’t wasted. And you can even add a shorter perpendicular hanging rod to maximize your small closet storage space on a side wall. This just means the closet rod is hung from front-to-back in the closet, as opposed to the traditional side-to-side. It’s best not to hang certain types of clothing (like sweaters), which should be folded instead. Folding your jeans (which are bulkier) and stacking them in drawers or open shelving can also save hanging space. Using the right closet accessories will produce an immediately noticeable improvement in the functionality of your small closet storage space. The low profile nature of these space-saving helpers also means you have the flexibility to add them just about anywhere in your small closet storage space. Other useful accessories that are ideal for small closet spaces include pullout pant racks, shoe racks, and a versatile four position hanger. 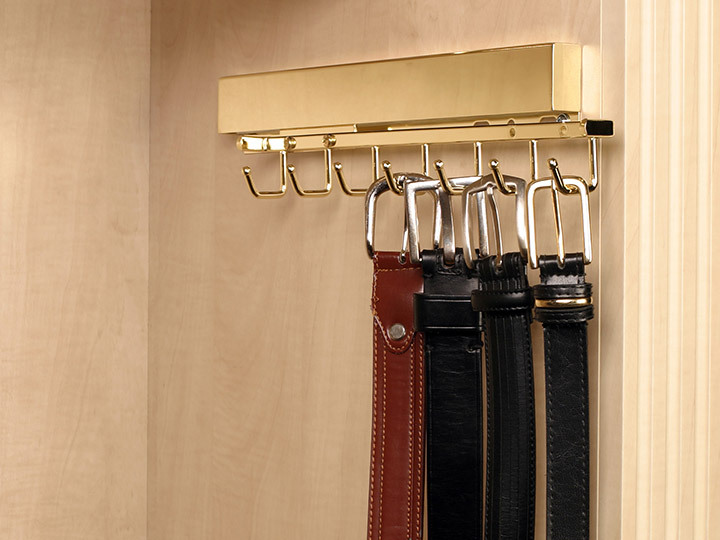 A low profile sliding belt rack is perfect for a small closet space. Make an effort to sort out as many small closet storage spaces in your home as as you can. If one closet is disorganized, there’s a tendency for a domino effect to occur with the level of organization and number of things in the rest of your closets. And remember, closet organizers and accessories aren’t just meant for the bedroom. Linen closets, laundry room closets, front entryway closets, and home office closets can all benefit from a closet makeover. Even though your home’s closets may be small, there’s another option that can expand your clothes storage space in a big way. A dressing room (also known as a large walk-in closet) can be created if you have a spare bedroom. Your small closet storage woes will disappear when you have a spacious dressing room to house whatever can’t fit in your small closets. And besides opening up your clothes storage options on a grand scale, dressing rooms also add luxurious style to your home’s décor. Our new Monogram collection of custom closet cabinetry is perfectly suited for dressing rooms and walk-in closets. You can fully customize your large closet space with the Monogram collection’s wide range of rich finishes and plethora of built-in accessories. 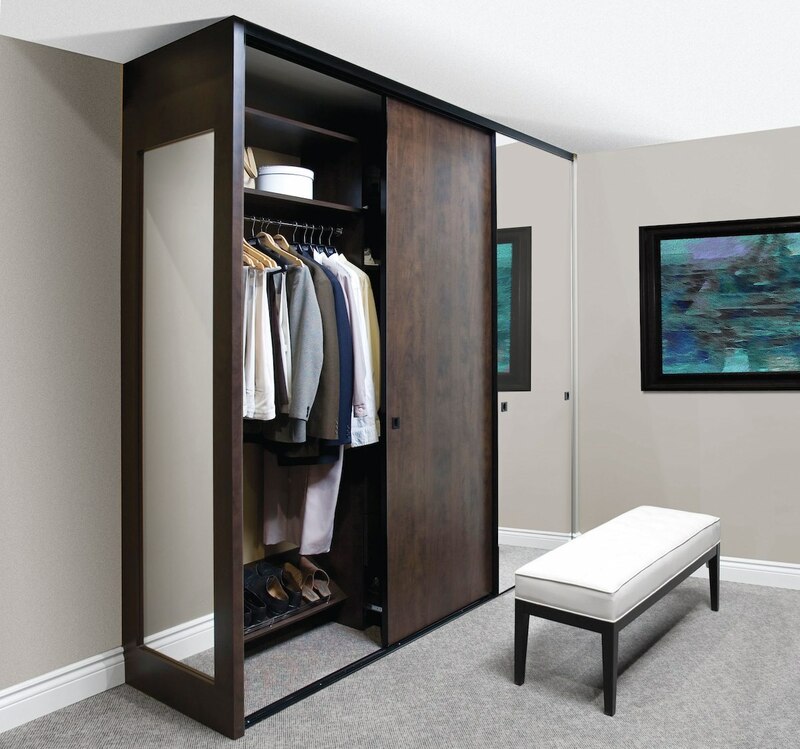 If you’re frustrated by your home’s small closets and you have a spare room, create a luxurious dressing room. The new Organized Interiors Idea Book is filled with lots of inspiring small closet storage space solutions. Allow one of our closet design professionals to evaluate your small closet space. They’ll show you how our organization and storage solutions can improve how your small closets function and look. Just schedule your free in-home design consultation. You cringe every time your closet doors are opened, bracing for the catastrophe that awaits within and the inevitable spike in your stress level. Is this a scenario that sounds all-too-familiar to you? If so, you’re one of many people who have to contend with their disorganized closets every day. And disorganized closets can have more negative effects on your life then you might imagine. Naturally, there are the obvious ways disorganized closets impact your daily life, such as wasting your time and the stress they cause. Dig a little deeper, however, and you’ll realize that the many drawbacks of having messy closets should provide plenty of incentive for you to fix the situation. Identifying the problem is the first step on your pathway to doing that. Do any or all of these seven negative effects of having disorganized closets resonate with you? Keeping your closets organized can eliminate some of your daily stress. The universal response to being asked “What’s the biggest negative effect of having disorganized closets?” will likely be that it’s a major cause of stress. Clutter and disorganization is just not conducive to keeping your headspace in a relaxed state. Some of that stress develops because clutter and disorganization disrupts our focus and concentration. Our brain processes the mess as one more thing on our to-do list that needs to be dealt with. And the longer we fail to deal with the problem, the more overwhelmed our brain feels. Feelings of guilt and shame manifest themselves in the form of health-threatening stress. That means you’re adding to your stress level every time you need to go into your messy closets. For most people, that’s an average of three or four times a day. And disorganized closets and home clutter also add to the already-high anxiety levels North Americans have. Another popular answer in response to how disorganized closets affect out lives would be that it causes us to waste a lot of time. Some of that stress and anxiety disorganized closets contribute to stems from the fact that too much time is wasted looking for specific items. Another home organization study conducted by Alpha Phi Quarterly magazine shows that more than two thirds of those surveyed believe they could save up to 30 minutes a day if they were more organized. This is in all areas of their life, not just when it comes to their closets. But disorganized closets are one of the biggest contributors to the hundreds of hours wasted by the average person yearly. So why are your closets so disorganized? Do you not declutter frequently enough? Is your closet space not being used properly or do you lack an efficient closet organizer? Look at any list of the most coveted features for homebuyers and ample closet space is sure to be near the top. And when we don’t have enough of it, we’re not happy. More than two thirds of homeowners polled by HSH.com named a lack of storage space as their biggest pet peeve. Contrary to popular belief, however, the cause of disorganized closets isn’t necessarily due to your closets being too small. A Soap and Detergent Association study reveals that 80% of household clutter is a result of disorganization, not lack of space. Your disorganized closets may also be making you think twice about buying a new clothing item you’d really like, just because you’re worried about adding it to the mess. Sure, a certain amount of self-discipline when it comes to clothes shopping is a good thing. It is nice, however, to treat yourself to a new dress or pair of pants once in awhile, too (and especially if it’s on sale at a great price). Make better use of your closet’s space by adding smart storage solutions like this pullout pant rack. When your closets are a mess, you definitely want to keep them hidden from view. Other than when you need something out of your closet, it’s a good bet that your closet doors will be closed around the clock. This will certainly be the case if you have houseguests over, but disorganized closets are also an embarrassment to show to the rest of your family. And, most importantly, you’ll be in a constant state of guilt over how out of hand you’ve let the situation get. With the stylish and attractive looks that closets can be designed with nowadays by a skilled designer, your closets should be a space that you look forward to entering, not dreading. There are an abundance of appealing finishing options and features available with a custom closet design. You can have a closet space created that actually adds to your home décor, instead of it being an area of your home that’s hidden as much as possible. An overstuffed closet makes it far more difficult to locate specific items. And it’s no wonder our closets have too many things – the number of household items we buy has skyrocketed in the past several decades. The Daily Mail newspaper reports that in the past 30 years, Britons’ homes have had a 133% increase in the average value of their contents. And the average closet of an American woman has 103 items in it. Because we have more clothes and shoes than we need, items in the closet get misplaced or even lost. Often when they are found much later, they’ve become fashion relics or no longer fit. It’s also estimated that 80% of your clothing is worn a mere 20% of the time. That’s mostly due to owning more than we need, as well as us being too disorganized to find items. As a result, this prevents us from getting our money’s worth out of the clothing by wearing things regularly. A full, poorly maintained closet doesn’t provide a friendly storage environment for your clothing and shoes. Clothing that’s crammed together while hung up is more likely to get wrinkled. It also makes it harder to find items. Clothing stored on open shelving or in closet drawers that are just thrown there instead of getting folded will also become a wrinkled mess. And shoes left in a disorganized pile on your closet floor will get scuffed and damaged. Disorganized closets also cause you to take other storage shortcuts, simply because you have fewer storage options. For example, if your shelving or drawers are full, sweaters might be put on a hanger, which leaves hanger marks. There’s rarely enough time in the morning to adequately take care of all your responsibilities before heading out to work. Being slowed down by hunting for a shoe or belt to match your outfit, or plain old indecisiveness when choosing an outfit, adds to the time we waste every morning. When you leave the house late, your day gets off to a bad start. You also don’t want to have to just “settle” on an outfit due to time constraints. This doesn’t put you in the most confident, relaxed state of mind you’d prefer to have to begin your day. 3 in 10 women from that OnePoll survey believe that having an organized closet would make their mornings less stressful. If you’ve been dealing with the headaches disorganized closets for too long, take some action. Disorganized closets cause needless stress and with the help of a closet professional, you can fix your closet problems. Transforming disorganized closets is what Organized Interiors specializes in. 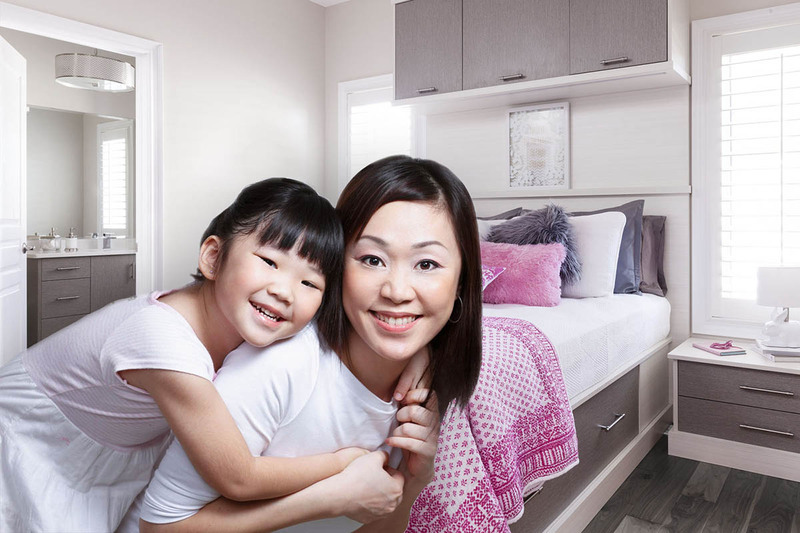 Whether it’s adding a custom closet organizer or suggesting other bedroom storage solutions like a bed surround or wardrobe, we’ve been improving the organization and storage capabilities of our clients’ homes for more than 40 years. 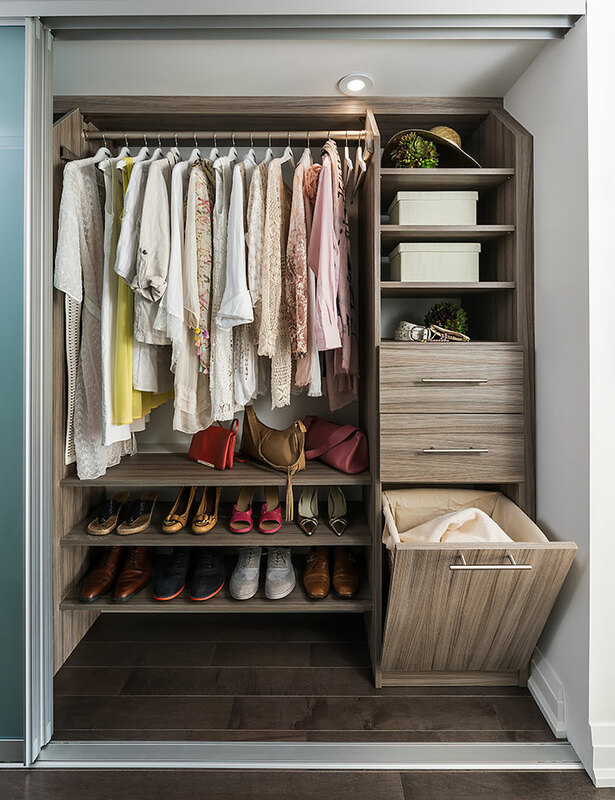 Schedule your free in-home design consultation with us to find out what we can do to transform the disorganized closets in your home. Custom Home Organization Solutions On A Budget: What Should You Prioritize? One of the foundations for any beautiful home is organization. If you’re looking to improve your home’s level of organization and are on a budget, you may be wondering – which home organization solutions should I prioritize? There are three important custom home organization solutions that we would suggest allocating your organization budget towards. These three organization and storage solutions will deliver effective results and reduce clutter in your home. Whether your closets are too small or you’re just not making the best use of their space, one of the most effective custom home organization solutions to choose is a closet organizer. A customized closet solution provides a place for every wardrobe item. You’ll find that keeping clutter minimized in your closet and bedroom space requires much less effort. Whether you want a simple closet organizer with various shelves, drawers, and a hanging rod, or a more complex walk-in closet organizer, you can find a design that works for your home and budget. SmartLine closet organizer: this modular organization system is flexible to accommodate your future storage needs. That means should you need to adjust the heights of hanging bars or shelving, you’ll be able to do so. Drawers, plenty of hanging space, and open shelving maximize your storage space. 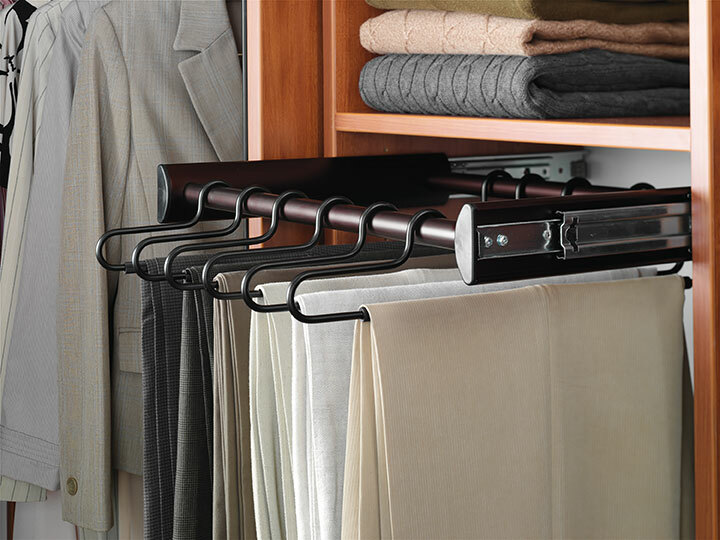 The SmartLine organizer is also wall-mounted, leaving your closet floor space clear. Classic closet organizer: this floor-supported custom home organization solution is ideal for closet spaces both smaller and larger, such as a walk-in. Get even more out of your closet’s storage space with the Classic’s deeper shelving and drawers. 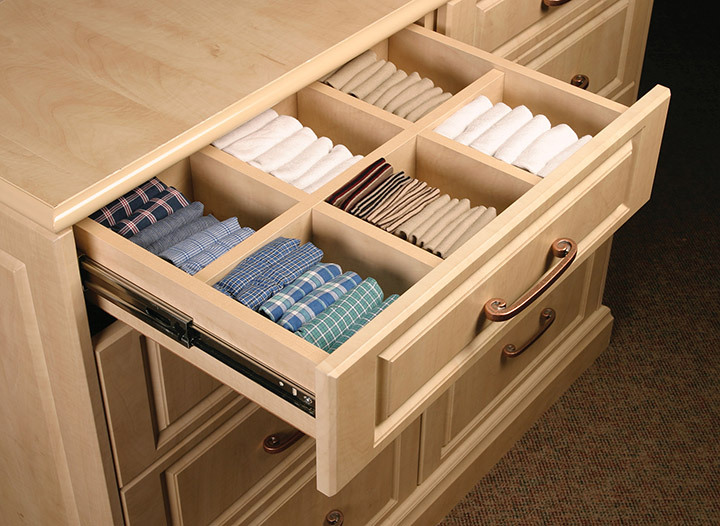 You can ensure this organizer complements your home’s décor with the available custom options. The Classic closet organizer’s deep drawers and shelves provide ample storage space. 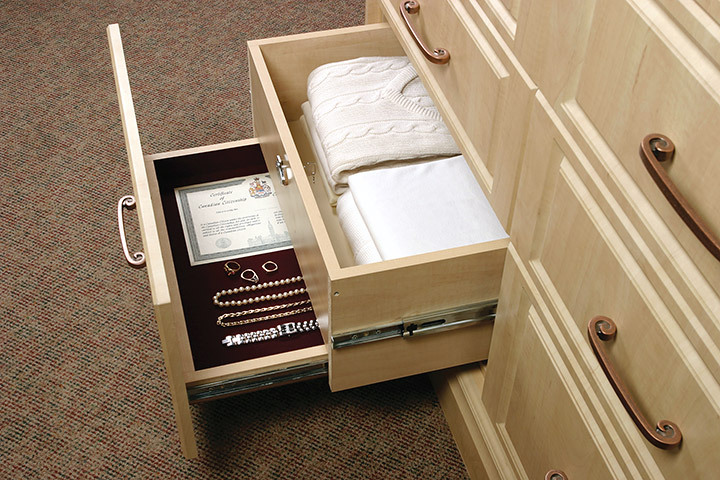 Keep your valuables discreetly stored in a hidden document drawer. Although you may be on a budget, you’ll find that choosing custom home organization solutions is worth the expense. Our design consultants can work with you to tailor all of your custom home organization solutions to your space and aesthetic preferences. That includes picking the type of finish or decorative hardware that your custom cabinetry is made with. We also manufacture and install our custom products, resulting in a professional beginning-to-end process that ensures quality control and complete customer satisfaction. Unlike inferior big box home organization products, we don’t believe a one-size-fits-all approach to home organization systems best serves our client’s needs. Schedule your free in-home design consultation so one of our design consultants can evaluate your space and find the best custom home organization solutions that will work within your budget.